Rights & Rightlessness: Rhoda Hassmann on Human Rights: Famine in Venezuela? note: for a more recent and updated version of the information in this blog, see my blog of August 20, 2018, entitled "Famine in Venezuela: Update." “Venezuela’s Crisis Spills Over,” a recent article in the New York Times International Weekly of the Hamilton Spectator (May 5, 2018, p. 1), stated that 5,000 people per day are leaving Venezuela. At this rate, 1.8 million people will have left by the end of 2018, joining 1.5 million who have already fled. This is over ten per cent of Venezuela’s population of 32 million. The Mirriam-Webster dictionary defines famine as “widespread scarcity of food, caused by several factors including… government policies. This phenomenon is usually accompanied or followed by regional malnutrition, starvation, epidemic, and increased mortality.” By this definition, Venezuelans may already be experiencing famine. At the very least, they are experiencing state induced hunger. Readers of my blog will know that I’ve been following Venezuelan politics since 2012. Hugo Chávez was elected President in Venezuela in 1999. He instituted several policies that were meant to feed poor Venezuelans, but actually made the situation worse. From 1999 to 2007 people’s living conditions improved, but food shortages started when oil prices declined. Chávez died in 2013 and was succeeded by Nicolás Maduro, whose draconian policies have created massive food shortages. According to Antulio Rosales (“An Ugly New Low for the Venezuelan President,” Globe and Mail, March 12, 2018, p.A11) and Enrique Krauze (“Hell of a Fiesta,” New York Review of Books, March 8, 2018, pp. 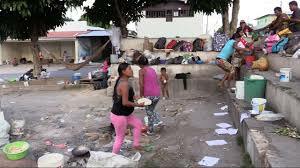 4-7), more than half of all Venezuelans have lost between 19 and 24 pounds, and 90 per cent say they do not have enough money for food. The minimum monthly wage in mid-2017 bought only 12 per cent of one person’s basic food needs, even less now. Sixty per cent of the population lives in extreme poverty. Formerly dormant diseases such as malaria, diphtheria and dengue are reoccurring, while hospitals are extremely short of personnel, medicines and the most basic equipment. Some people receive subsidized food boxes, but the contents are inconsistent and insufficient, are distributed irregularly, and are more likely to go to supporters of Maduro than others. This shortage of food is a completely predictable consequence of the policies that both the Chávez and Maduro governments favored over the last two decades. They destroyed the market in food by imposing control prices that resulted in underproduction when the official prices did not meet costs of production. The government expropriated farms, ranches, and even food distributors such as butchers. There’s very little if anything produced on these expropriated territories. Food is now heavily controlled by the black market and by corrupt importers (often members of the military who are also Maduro’s cronies) who sit on food at the ports to drive up the price. At the same time political appointees, rather than competent managers, now run the state oil company. Failure to reinvest has meant that oil production has fallen drastically, so that Venezuela’s earnings of foreign exchange have diminished. To keep all this going, the government has undermined the rule of law and the judiciary, and arrested independent trade union leaders. It has manipulated elections and is attempting to replace the legitimate elected legislature, where there are still some opposition members, with a “Constituent National Assembly” completely loyal to Maduro. Both Chávez and Maduro have ruled by decree and used arbitrary arrest, torture and even executions to maintain themselves in power. Maduro also controls the media: it is illegal now to post pictures of empty store shelves or images of desperation, supposedly because it foments hatred. It’s very difficult to know what to do about this. The US has imposed sanctions on some Venezuelan individuals, freezing their assets and banning travel to the US. 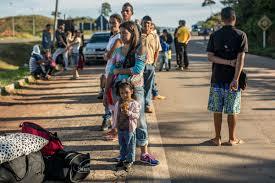 It’s also prohibited financial dealings by US citizens with these sanctioned Venezuelans. Maduro replies to these measures by accusing the US of imperialism, an easy accusation to make given its real history of imperialism in Central and South America. There’s also been some regional pressure on Maduro. He’s been barred from visiting some other South American countries: Peru withdrew his invitation to the 8th Summit of the Americas for April 2018. The Organization of American States tried to persuade Chávez to change some of his policies, but he replied by withdrawing from the Inter-American Commission on Human Rights in 2012. I think that Maduro and his cronies should be referred for trial to the International Criminal Court, which Venezuela joined in 2002. On Feb 8, 2018 the ICC Prosecutor opened a preliminary investigation into alleged crimes against humanity such as arbitrary detentions and torture. The ICC Statute considers extermination via denial of food as a crime against humanity, but the preliminary investigation did not mention this. Individual Venezuelan citizens have hardly any recourse to outside institutions to help them in their search for food and medicine. Citizens of some states can complain about violations of their right to food to the UN Committee on Economic, Social and Cultural Rights, but all that committee can do is make recommendations or “name and shame” rights-violating states. But even this doesn’t apply to Venezuela, which hasn’t ratified the necessary international treaty to permit its citizens to make individual complaints. Nor is there a world human rights court that would hear individual complaints against a state and ensure the individual’s right to an effective remedy. But even if it did exist, such a court would not necessarily have the right to demand that all affected citizens, not merely the individuals making the complaint, should have their grievances addressed. There is no international legal mechanism to stop perfectly predictable state-induced food shortages before they happen. Nor can any legal mechanism hold entire regimes accountable, even when all or most senior government officials are complicit in the wrong-doing. All the ICC can do, if it gets that far, is try individuals, not an entire government. Except for committing genocide or crimes against humanity, states (or the governments of those states) still have the sovereign right to violate their citizens’ human rights. They also have the sovereign right to choose whatever “development” path a state elite wants, even if that so-called development is bound to fail and result in de-development, if not outright starvation, as in Venezuela. These states’ rights are sacrosanct, and far more important to the international “community’ than the rights of starving citizens. So for the foreseeable future, Venezuelans will continue to flee in their hundreds of thousands to Brazil, Colombia and elsewhere, in search of food.